The artist discusses We the People and other installations. Photograph: Courtesy of Anna R RessmanDanh Vo, We the People, 2011. 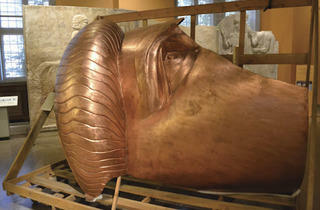 Photograph: Courtesy of Anna R RessmaDanh Vo, We the People, 2011. For We the People, an installation at both the Art Institute of Chicago and the University of Chicago campus, artist Danh (pronounced “Yahn”) Vo replicated full-scale sections of the Statue of Liberty—in a factory in China. He distributed these made-in-China fragments of an American icon to locations around the world. The much-publicized work reflects Vo’s interests in artistic production, political commentary and the global mobility of ideas. Global mobility is a theme in the 37-year-old’s life as well: Born in Vietnam and raised in Denmark, Vo owns an apartment in Berlin, but the globe-trotter has no permanent artistic base. “I’ve tried to avoid having an office and a studio,” Vo says. “Exhibition spaces become my testing grounds.” Indeed, Vo’s show at the Renaissance Society, “Uterus,” suggests a womb-like place for germinating ideas, rather than a setting for finished products. 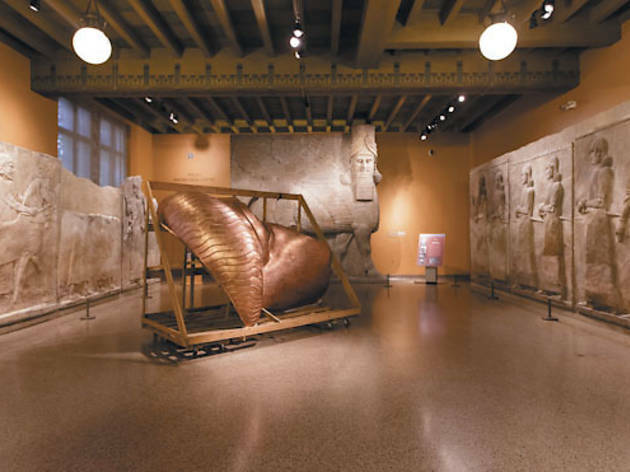 Instead of large-scale works like We the People, the Ren gallery contains surprisingly small-scale installations—flowers in a gilded cardboard box, a stack of copper ingots, a silicone cast of his mother’s tongue—that slowly, quietly captivate the viewer. Vo often works in opposition to people’s expectations of him as an artist: “I have a resistance to being boxed in,” he says. Installations like Twenty-two Traps and We the People have multiple, personal meanings for the artist—one piece incorporates a crate for Carnation Evaporated Milk, which Vo says is a popular foodstuff in his birthland—but he resists explaining them in detail so that viewers can glean their own meanings. Perhaps this is why there are so many different explanations of We the People in the press. 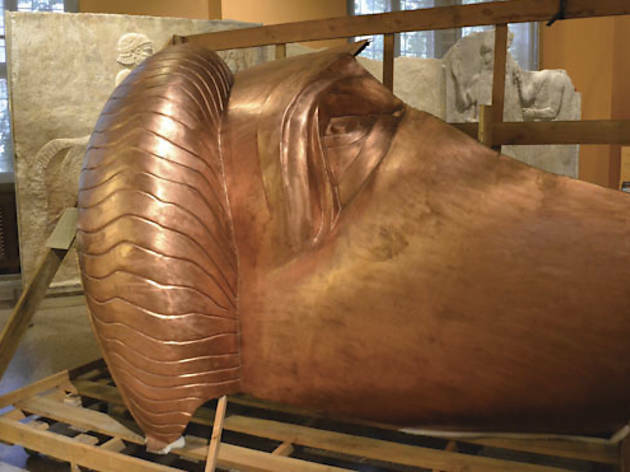 Each giant copper fragment takes on a new meaning depending on its location. Displayed next to the monumental Assyrian reliefs inside U. of C.’s Oriental Institute (pictured), We the People seems to nod to Western society’s roots in the Fertile Crescent. Or is it a statement about the U.S. military’s presence in the Middle East? Or is it a commentary on the rise—and eventual collapse—of civilizations, including our own? You get the idea. Vo’s work frequently involves contrasts, juxtapositions often reflected in the artist’s choice of materials. Heavy materials like copper and wood play against lighter materials like plastic sheets and paper in 56 x 45 x 25 cm (2012), a sculpture featuring a fragment of a 15th-century wood carving small enough to fit into carry-on luggage. In other works, the contrasts are more conceptual. Vo’s installation The Collection of Leonard Lyons Letters from Henry Kissinger (2008) comprises 14 letters that reflect both Kissinger’s love of the performing arts and his secret bombing of Cambodia—a metaphor for humanity’s penchant for cultural production and physical destruction. 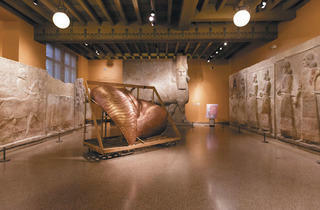 “Danh Vo: Uterus” runs through December 16 at the Renaissance Society. 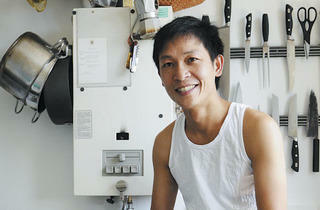 “Danh Vo: We the People” runs through November 11 at the Art Institute’s Pritzker Garden.